Wilbur Montgomery Hinshaw6,7,8,9 [Wilber Hinshaw10]. Hinshaw, Wilber, head-of-household, age 39, born Dec 1860 in Washington; parents born in Indiana; married 9 years; occupation: saloon keeper; owned home (free). Hinshaw, May, wife, age 28, born Mar 1872 in Indiana; father born in Ohio; mother born in Indiana; married 9 years; 4 children, 4 living. Hinshaw, M. Edna, daughter, age 8, born Aug 1891 in Washington; father born in Washington; mother born in Indiana; attended school 7 months. Hinshaw, Floyd, son, age 5, born Oct 1894 in Washington; father born in Washington; mother born in Indiana; attended school 4 months. Hinshaw, Marie, daughter, age 4, born Mar 1896 in Washington; father born in Washington; mother born in Indiana. Hinshaw, Martha, daughter, age 1, born Sept 1898 in Washington; father born in Washington; mother born in Indiana. Hinshaw, Wilber, head-of-household, age 49, born in Washington; parents born in United States; married 19 years; occupation: farmer, farm; owned farm (mortgaged). Hinshaw, May, wife, age 38, born in Indiana; parents born in United States; married 19 years; 6 children, 5 living. Hinshaw, Edna M., daughter, age 18, born in Washington; father born in Washington; mother born in Indiana; attended school. Hinshaw, Floyd K., son, age 16, born in Washington; father born in Washington; mother born in Indiana; attended school. Hinshaw, Martha J., daughter, age 12, born in Washington; father born in Washington; mother born in Indiana; attended school. Hinshaw, Vera E., daughter, age 8, born in Washington; father born in Washington; mother born in Indiana; attended school. Hinshaw, Herold H., son, age 5, born in Washington; father born in Washington; mother born in Indiana. Hinshaw, Mae, head-of-household, age 55, born in Indiana; parents born in Ohio; widow; rented home; occupation: none. Hinshaw, Vera, daughter, age 17, born in Washington; father born in Oregon; mother born in Indiana; attended school. Hinshaw, Harold, son, age 15, born in Washington; parents born in Washington [sic]; attended school. Hinshaw, May M, head-of-household, age 59, born in Indiana; father born in Indiana; mother born in Ohio; widow, first married at age 19; owned home ($800 value); no radio in home; occupation: farmer, farming. Hinshaw, May, head-of-household, age 65, born in Washington; completed 8th grade; on Apr 1 1935 was living in rural Stevens County, Washington; widow; owned home ($1100 value). 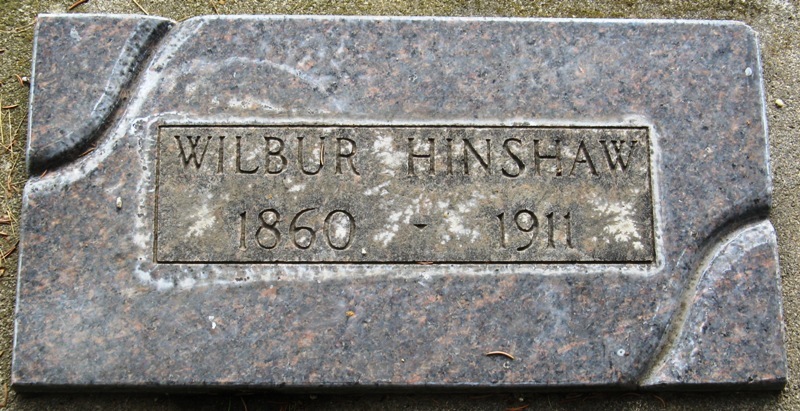 WILBUR HINSHAW was born in Walla Walla county, Washington, on December 9, 1860, the son of Luke and Isabel (McKinney) Hinshaw, both now deceased. At the age of three years he was taken by his parents to Washington county, Oregon, where he later attended the common schools as he grew to manhood on a farm. In the spring of 1879 he came to Walla Walla, and the following year he, with his father and mother, his brother, John D. and sister, Endora [sic], came to Lincoln county, where his father took a homestead in the vicinity of the present site of the town of Mohler. Here they engaged in the stock business, having an abundance of open grazing land, -- in fact their nearest neighbor lived distant ten miles. In 1891 Wilbur Hinshaw took a homestead, which he still owns. He has added to his original claim until he now owns three hundred and twenty acres, about one half of which is cultivated farm land, and the remainder used for pasturage of live stock, the raising of which is one of the leading branches of his agricultural business. In this business he is in partnership with his brother. Mr. Hinshaw was married to May Lacey, a native of Indiana and daughter of John B. and Martha Lacey, both now living in Stevens county, Washington. This union has been blessed with four children: Edna M., Floyd K., Martha and Vera. Mr. Hinshaw is a prosperous and prominent farmer, and it is the general supposition that he was the first male white child to be born in Walla Walla county. 1920 census, Colville, Colville Precinct, Stevens County, Washington; roll T625-1938, ED 282, page 9A, line #25, dwelling #34, family #35. 1880 census, Crab Creek, Spokane County, Washington Territory; ED 63; page 83, line #45, dwelling #30, family #30. Biographical sketch of Luke Hinshaw. Ancestry Family Tree data "(Unbewust) Sweet Family Tree" posted by "KirstenUnbewustS" (). 1930 census, Marcus Township, Stevens County, Washington; roll T626-2520, ED 50, page 1A, line #10, family #4. 1940 census, Colville, Stevens County, Washington; roll T627-4364, ED 33-20, page 2B, line #60, household #54.